This is a truly beautiful deck, offering 25 gorgeous cards and high quality accompanying book. 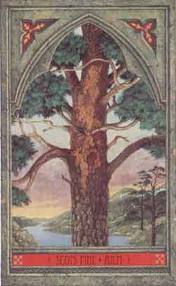 The cards use the trees of the Celtic Tree Alphabet, and the deck is a great way to get to know this system - although I'm sure it would also appeal to those who are already familiar with it. The book offers considerable background information on divination using trees, and on the concept of the Green Man before getting into each card separately. 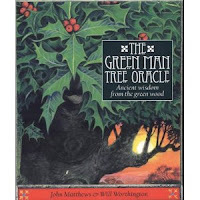 For every tree in the lavishly-illustrated deck, we get a single sentence summary of "Green Man Wisdom", as well as a detailed divinatory meaning and plenty of information about lore relating to that particular tree. Scots Pine, for which the wisdom is "seek an overview". Good advice indeed, since I've been very 'stuck in the details' lately. The divinatory meaning section talks about wise men shinning up trees and poles to gain a literal overview of their domain. I can't quite manage that, but I can remind myself to take a step back and examine the larger view. It's so easy to get bogged down in doing what you're doing without really thinking about why, isn't it? And that's how we end up sidetracked. I've been kind of peripherally aware for a while that I'm not spending my time in the best ways to achieve my bigger goals because I'm, for example, picking up more teaching than I really want, which is depriving me of energy to do the writing that I want to. I seem to be eternally saying "I'll just get past xyz", and then I'll be able to do more 'me' writing. Well, it's not working. I need to commit to more regular fiction writing time, even if it's only small chunks. I hope you do take more time to dedicate to what you really want!